On the issue of the Rafale fighter jet deal, Gandhi reiterated his charge of Modi backing industrialist Anil Ambani in getting a related offset contract. 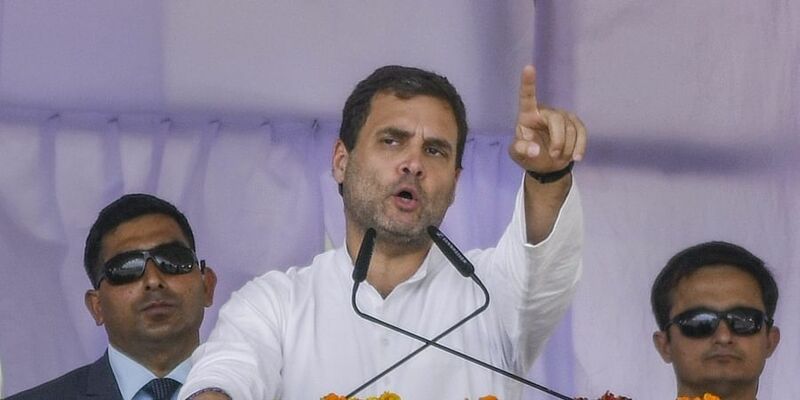 DEHRADUN: Congress president Rahul Gandhi launched his party's campaign for the upcoming Lok Sabha polls in Uttarakhand on Saturday, saying Prime Minister Narendra Modi was posing for cameras at the Corbett National Park for a documentary when CRPF jawans were being killed in Pulwama. At a rally here, in which BJP veteran and former Uttarakhand chief minister Bhuvan Chandra Khanduri's son Manish Khanduri joined the Congress, Gandhi also said his party would introduce a scheme of a guaranteed minimum income for the poor if elected to power. "Immediately after the Pulwama attack, in which 40 CRPF jawans were killed, the Congress had said it was with the government and the country. I had cancelled all my programmes." "Everyone knows what Narendra Modi was doing when our jawans were being killed in Pulwama. He was posing for the cameras to shoot for a National Geographic documentary," Gandhi said to loud cheers from a large gathering at the Parade Ground. "Modi shoots for three-and-a-half hours on a day something like Pulwama happens and he still talks about patriotism," the Congress president added. On the issue of the Rafale fighter jet deal, Gandhi reiterated his charge of Modi backing industrialist Anil Ambani in getting a related offset contract, a charge repeatedly denied by the government. "All of you must have heard of Anil Ambani. Can he make an aeroplane? He cannot even make a paper aeroplane as children do," he said, holding up a piece of paper. "Still, Modi took him along with him as part of his delegation to France to ensure that he got the deal worth Rs 30,000 crore," he added. Reiterating the "chowkidar chor hai" (the watchman is a thief) barb, the Congress president said he had posed four questions to the prime minister in Parliament on the Rafale deal. "The prime minister delivered a long speech lasting one-and-a-half hours in Parliament but failed to answer even one of my questions. All he did was keep looking up, down and sideways. Why? Because he is guilty," he said and asked the youth of the state to pose the same questions to Modi when he comes to Uttarakhand for campaigning. "Even the then defence minister Manohar Parrikar is on record saying he had no knowledge about the deal as it was being negotiated directly by the prime minister," he claimed. Gandhi also linked the recent removal of the CBI director to the Rafale deal, claiming that the official wanted to investigate it. He also accused the Modi government of protecting fugitive businessmen such as Vijay Mallya, Nirav Modi and Lalit Modi and wondered "why every wrongdoer is a Modi". Gandhi claimed that Mallya had met Finance Minister Arun Jaitley before fleeing the country. At the rally, BJP veteran and former Uttarakhand chief minister Bhuvan Chandra Khanduri's son Manish Khanduri joined the Congress in the presence of Gandhi. The Congress president also mocked the Kisan Samman Nidhi Yojana announced by the Modi government for farmers, saying the hype was big but the amount being given was paltry. "I asked (Congress leader) Mallikarjun Kharge and was told that farmers were going to be given a dole of Rs 3.5 per day," he said. The Congress chief said if elected to power, his party would introduce a scheme of a guaranteed minimum income for the poor, which will go straight into their bank accounts. He added that everyone earning below a certain level would be given a guaranteed minimum income. And Rahul has been posing before Gods and goddesses to dupe Hindus of their faith. Gandhi gandagi!